I have a lovely cousin, Isabelle, who lives in Peckham and who is a chef, and she is putting together some lovely Recipes for us! 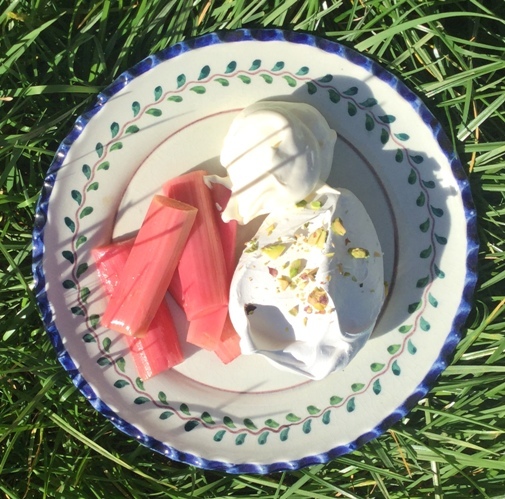 Pistachio Meringues with Poached Rhubarb: is amazing: the rhubarb is baked in the oven in orange Juice and caster sugar and covered in foil, so keeping its shape. 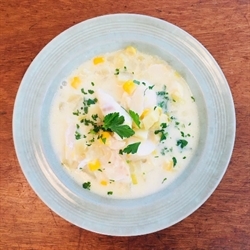 Smoked Haddock & Sweetcorn chowder: my kids presented impressively furrowed brows at the prospect of eating fish soup for dinner, but i promise you, those brows disappeared! 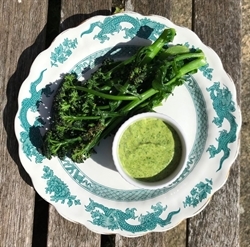 Wild Garlic Mayonnaise - whipping up a batch of your own mayo with seasonal wild garlic is hugely satisfying, really tasty and very versatile. And what egg yolks you have left over from making the meringues - you just use on the mayonnaise - an efficient use of food!